Our Colorado country inn features a small herd of dairy goats. Guests are always pleasantly surprised when interacting with our pet goats: they find out just how friendly and amusing the goats are! We originally wanted to have goats back in Washington to clear our land of brush. In 2006, Gina picked up three orphaned goats that had just lost their mama. At just three weeks old, these kids quickly stole her heart. More goats followed, and soon she had opened Naughty Goat Animal Rescue, a sanctuary for unwanted goats. Gina would pick them up in various places, in various states of health and rehabilitate them to the point where they would be adopted out as barnyard pets. Our dairy goats provide milk to support our in-house cheese making. You may enjoy varieties of goat cheese at breakfast during your stay! The milk is also used for our Cheese Making Classes, where students learn how to make cheese. From raising goats, Gina quickly learned that goats are very emotional creatures! They live in packs, or herds, and will cry endlessly if separated from their herd. Also, goats are extremely affectionate with their humans, especially if you raise the goats from infancy and bottle feed them, they will consider you their mom/dad and follow you around. There is a definite pecking order to the herd: the matriarch will let the youngsters or new goats know their place. The horned goats usually have an advantage over the non-horned goats when it comes to feeding time, and we have had to wrestle with this situation at Mountain Goat Lodge, as we have both horned and non-horned goats. 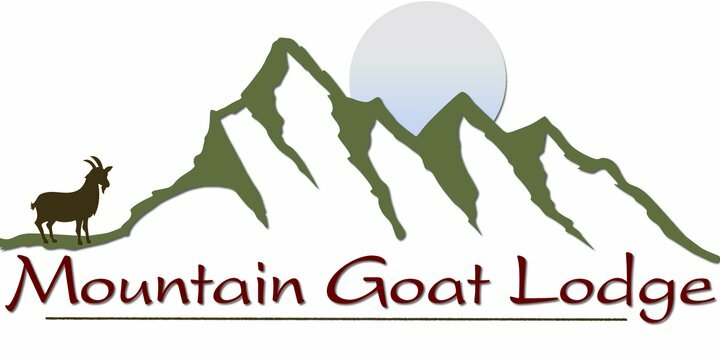 Our dairy goats have added to the agritourism draw of Mountain Goat Lodge, and our guests enjoy learning about, and interacting with, our goats! Why are some of our goats horned, and some de-horned? Most goats are born with horn buds, and a relatively painless procedure can be used to burn the horn buds and male scent glands off a baby goat before they sprout into horns. To debud a baby goat is completely a matter of preference. Personally, we like the horns and think they are beautiful, but you do have to be careful around them. The horns have a blood supply and do not shed annually like elk horns, but are instead natural radiators that keep the goat cool in hot weather. Speaking of weather - one of the advantages of living in Colorado is how well the goats do in the high desert climate. Goats originated in the arid desert and high mountain regions of Africa and the Middle East and migrated up through the Swiss Alps (Remember Heidi?). Here at the Lodge, we have 2 different breeds. Each of our goats has a distinct personality and of course, their own name. All of our goats are dairy goats. They are also our pets. The Oberhasli has a deep brown coat with black face, legs, and spine, a medium-sized Swiss dairy goat. A few of our Obers are solid black, a genetic mutation that we find quite striking. We love the Oberhasli breed for their spirited and wild nature, and quiet personality. The other breed is the tri-colored French Alpine. These goats are similar to the Oberhasli, except for their white, tan and brown markings. Neutered male goats are referred to as Wethers, and females are called Does. Intact males are called Bucks. Some people still refer to goats as Nannys and Billies, but that has gone out of fashion these days. We do allow some breeding within our flock to ensure a moderate milk supply for our Inn. Breeding occurs around October and kids are born in March. Gestation is five months, and we wean the kids off their mothers at about 2-3 months of age. The babies are adopted out to good pet homes, and the does are milked until the end of October. © 2018. Mountain Goat Lodge. All rights reserved.